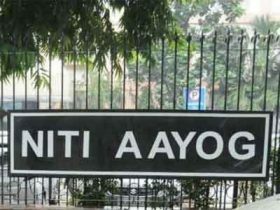 New Delhi: Raising serious concern over the framework proposed in the National Medical Commission draft bill, an alliance of doctors alleged that NITI Aayog’s report on the matter seeks to “further accelerate” privatization and commercialization of medical education in the country rather than keeping it in check. The Alliance of Doctors for Ethical Healthcare (ADEH) called the bill and the report a “huge disappointment” and said the treatment being suggested by the government think-think to reform and replace the Medical Council of India (MCI) is “even worse than the disease it is supposed to remedy”. “The draft bill and the report by NITI Aayog should have suggested a policy that would keep a check on growing commercialization of medical education in India, but instead the policy directions given shows that it seeks to further accelerate privatization and commercialization of medical education in the country,” Dr Abhay Shukla, member ADEH, alleged. At a press conference in New Delhi, Shukla and two other ADEH members further said that overall, protection of patients and need for strong clampdown on widespread unethical practices are clearly not a priority in the report and the bill, and the related provisions remain very weak. “Despite recommendations of the parliamentary panel on health, the draft bill does not make provisions for a dedicated Board of Medical Ethics and this crucial function has been collapsed into a Board for Medical registration,” Shukla said. ADEH, a national network of over 150 doctors from various specialties, is a civil society that promotes ethical and rational healthcare. Dr Arun Mitra, Chairman of Ethical Committee in the Punjab Medical Council, and member of ADEH, alleged that the proposed National Medical Commission, if it comes into force, would not only lead to “proliferation of sub-standard medical colleges” but also “legitimise corruption” in the system that is already plagued with huge corruption. “The report says there should be no ceiling or regulation of fees in private medical colleges for the majority of students. This would lead to legalisation of astronomical sums being charged by many private medical colleges in modified form,” he said. Mitra cited example of a college in Punjab that recently allegedly increased its fees. Shukla said the bill also proposes that “now ‘for profit entities’ including businesses and corporations would be officially allowed to open and run medical colleges, thus legitimising and legalising profiteering in medical education”. Besides, composition of the proposed commission, which is “entirely based on nominations, would ensure that this body would be tightly controlled by a section of bureaucracy”, he alleged. The four-member committee, headed by NITI Aayog Vice-Chairman Arvind Panagariya, formed in March made its preliminary report public earlier this month and has invited public comments on the National Medical Commission Bill, 2016, till August 31.